Greetings from the Isles of Scilly, 28 miles off the coast of southwest England. The islands are part of the county of Cornwall, which has been our focus since last Saturday. We’re near the end of our new 10-day Cornwall Experience trip… and what a fantastic time we’ve had! 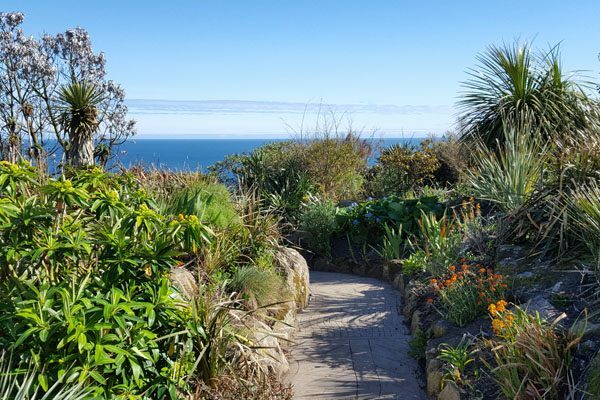 Our group has been surprised by many aspects of Cornwall: the prehistoric sites, the dramatic scenery, the picturesque fishing villages, the subtropical vegetation, the glorious gardens, the industrial and mining heritage. But the biggest surprise has been the quality, presentation, and variety of our meals here in Cornwall. Every meal has been outstanding! Cornwall is a truly unique part of Great Britain… still British but with a different climate and culture, very much impacted by its position on the narrow southwestern coast. The warm gulf stream currents bless the area with a semi-tropical climate. (Yes, there are palm trees!) 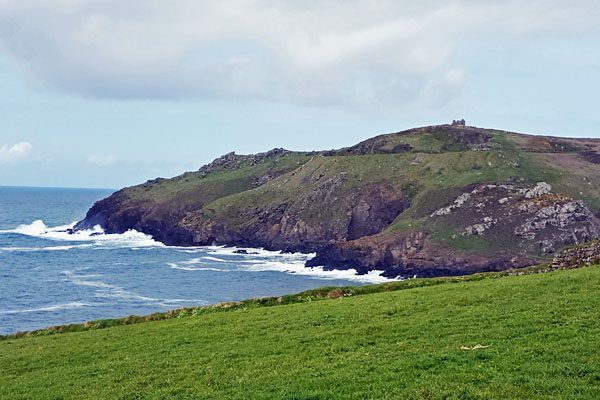 Cornwall’s remoteness from the rest of Britain has always impacted its sense of individuality, and Cornwall even had its own language in earlier times. There are over 300 miles of coastline, much of it rugged, influencing a history of sailing ships, fishing villages, pirates, smugglers, and shipwrecks. The area was inhabited in prehistoric times and many ancient monuments are still standing, more than any other place in Britain. Later, Cornwall was a major area for tin and copper mining, vigorous industries before they were abandoned in the late 19th century. 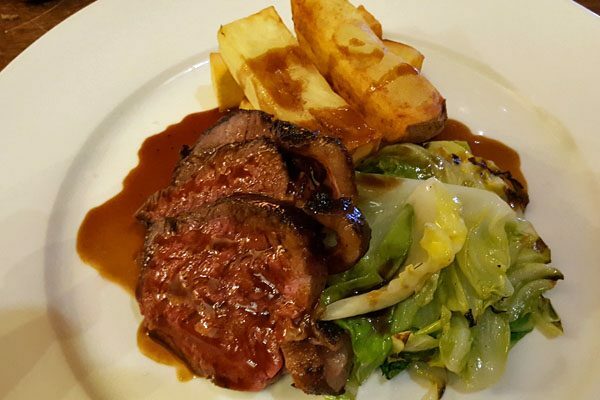 We’ve been traveling in England for over 25 years and have seen a substantial improvement in the cuisine across the country, especially in areas like Cornwall and the Cotswolds where there is a real focus on locally-grown products. Even the traditional British food served in pubs has been significantly enhanced, and many pubs are now classified as “gastro-pubs,” known for their outstanding cuisine. Cornwall has its own cuisine, unique in Great Britain. The traditional Cornish cuisine is heavily based on the geography of the county (isolated from the rest of the country and surrounded on three sides by the sea), its social history, and the ingredients that are readily-available. Cornwall is surrounded by seas that are historically well-stocked with fish, so fish forms a major part of the historical and modern recipes in Cornwall. The fishing industry continues to be very important to the economy of the county, and fish and shellfish are readily available. Newlyn, near Mousehole where our Cornwall Experience trip is based for the first week, is the largest fishing port in the UK. 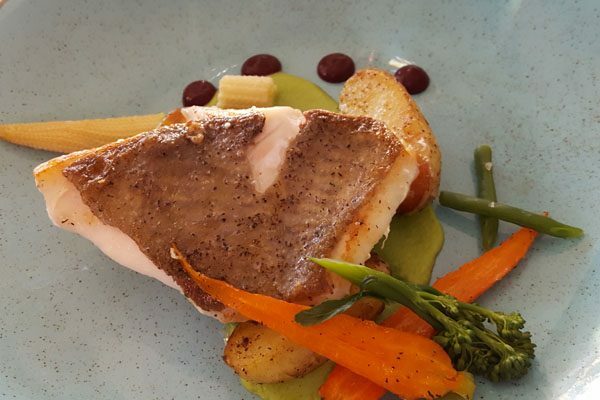 Local fish frequently found on menus include hake, plaice, haddock, cod, monkfish, skate, sea bream, turbot, sole, brill, John Dory, and mackerel as well as shellfish like crab and mussels and scallops. The fish is always fresh and local. 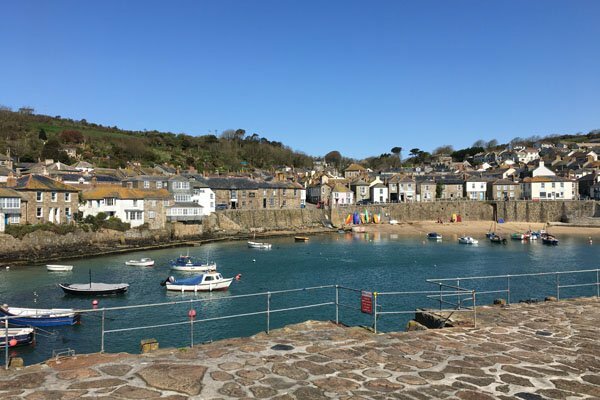 One chef in Mousehole told us he just calls the fish market in the next village of Newlyn every morning to ask what’s fresh… then plans his menu around that. Due to its unique climate in Great Britain, agriculture and farming are also important industries in Cornwall, with local farms growing top-quality vegetables and fruit, often used in making excellent jams and chutneys. The area also has a significant dairy industry, and many dishes are based on dairy ingredients. Nowadays Cornwall is as well-known for its organic beef and pork, artisan cheeses, and air-dried charcuterie as it is for fish and seafood. Game meat from the local area is included on many menus. A relatively-new focus involves foraging edible plants and berries from the hedgerows and cliffs, often including these as garnishes. 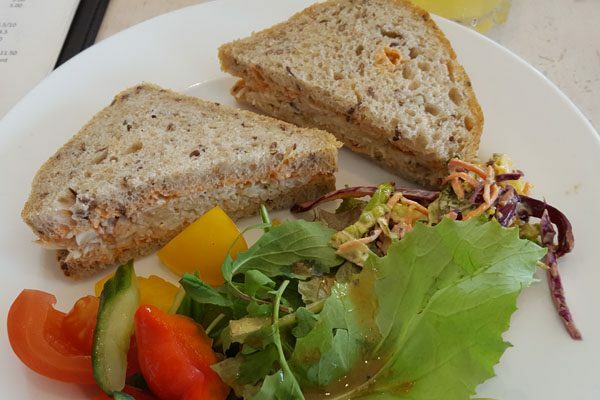 Today Cornwall is considered a “foodie destination” in the UK with a mix of traditional heritage and modern British cuisine, and it’s often called the UK’s food capital. You can choose from fine dining restaurants, seafood joints, beach cafes, and historic pubs. Several celebrity chefs (Rick Stein, Nathan Outlaw, Jamie Oliver, Ben Tunnicliffe) have restaurants in Cornwall, and locally-sourced products are promoted by many restaurants. 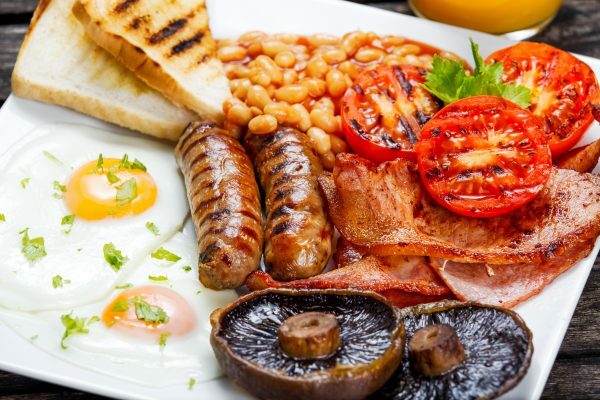 A Full Cornish Breakfast: The local variation of the “full English breakfast.” This cooked breakfast normally includes fresh local eggs (usually a choice of fried or scrambled), bacon (similar to country ham), a broiled tomato, and sometimes a grilled sausage, mushrooms and/or baked beans. The “full Cornish” might also include local specialties like smoked salmon, herring, or pilchards, and sometimes blood pudding. You don’t have to take the full complement of items and can ask for just what you want. A rack of toast is also provided, usually a choice of white or whole grain (granary) bread. All this is in addition to continental breakfast offerings. You definitely can’t eat this much breakfast every day, but try it at least once! The Cornish Pasty: The iconic dish of Cornwall, this savory eat-with-your-hands pie has its roots in in the historic mining industry. Now found around the UK, it accounts for more than 5% of the Cornish economy. Made with a short-crust pastry, the pasty was designed to be carried by miners in their lunch pail and eaten with one hand. 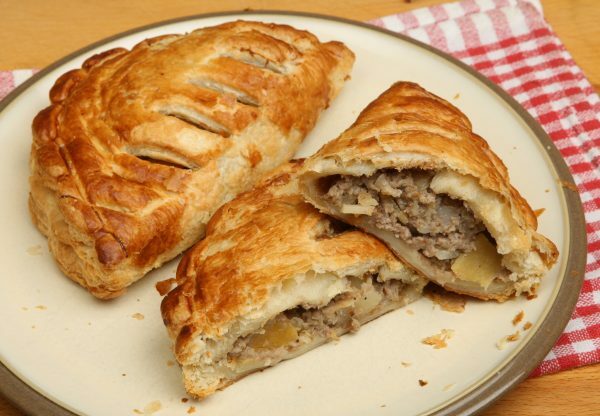 The traditional pasty (locally called an “oggy”) contains diced beef, onion, potato and swede (a vegetable similar to a turnip) and is made with a crimped crust on one side. In additional to the traditional pasty, other variations can now be found such as chicken and mushroom, steak and stilton, and vegetarian options. The filling is not pre-cooked but it cooked inside the pastry. Newlyn crab: Newlyn crab (from the famous fishing village between Penzance and Mousehole) is the standard by which all other crabs are measured and is often found in crab sandwiches or crab soup or simply served as “dressed crab.” The sweeter white meat from the crab’s claws is most highly prized and is used for dressed crab and crab sandwiches (never mixed with mayonnaise and recommended on brown bread). The richer brown meat is preferred for stocks and soups. Clotted Cream: The climate of Cornwall makes it ideal for growing the rich grass required for dairy farming, leading to the production of one of Cornwall’s other famous exports: clotted cream. Clotted cream forms the basis for other local specialties such as Cornish fudge and Cornish ice cream. 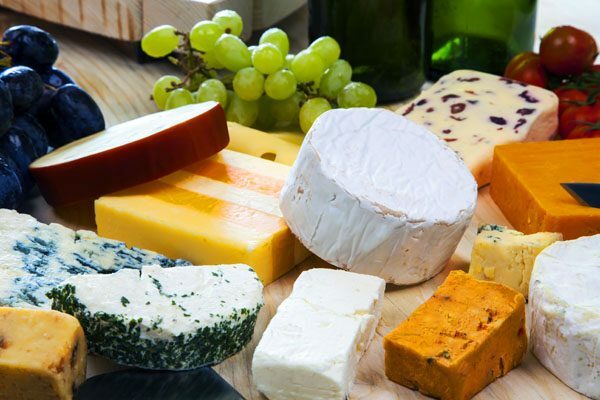 Cornish cheeses: There are around 60 varieties of cheese produced in Cornwall, but Cornish Yarg is the best known. The recipe is said to date back to the 13th century but it was revived in the 1960s by Allan and Jenny Gray. (Yarg is their last name spelled backwards.) Yarg is a semi-hard cow’s milk cheese aged wrapped in nettles which forms an edible rind. Other award-winning cheeses include Kern cheese (similar to a Comté or Gouda) and Cornish Jack (a cheese with alpine characteristics). Cheese often served in Cornwall as an option for dessert. Cornish Cream Tea: The cream tea is another famous culinary tradition of Cornwall. A traditional Cornish cream tea involves a fresh scone sliced in half, spread with a good helping of strawberry jam, and then topped with a generous dollop of clotted cream. This is served with a pot of tea. You can order a “Devonshire Cream Tea” in the neighboring county of Devon. The ingredients are exactly the same, though the cream and jam likely comes from Devon. The important difference is that in Devon the cream is applied first and then the jam. In Cornwall it’s always jam first, then cream! 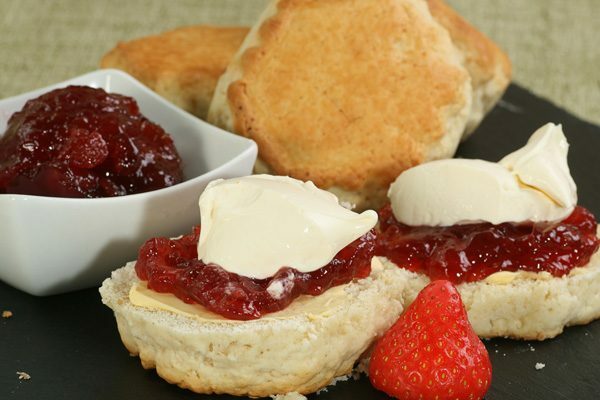 Cornish cream tea – always jam first! England is no longer just the land of fish-and-chips and meat-and-potatoes. Our group has a number of people with special dietary needs: a vegetarian, a vegan, someone who is gluten-intolerant, someone who doesn’t eat meat, a few people who don’t like fish or seafood. Every place we’ve eaten has made it a priority to provide every diner with an excellent meal that fits their needs. If you come to Cornwall, don’t hesitate to let the eating establishment know about any special dietary needs… I believe you’ll be well taken care of! On every European Experiences trip, we want to provide memorable meals in a variety of settings. We always want to showcase the regional cuisine and specialties of each area and enjoy meals together in interesting venues with excellent service. We’ve certainly achieved this goal on the Cornwall Experience. Fortunately with the emphasis on fresh fish and vegetables, most of the food is very healthy… and we’ve also balanced all the good eating with lots of walking! 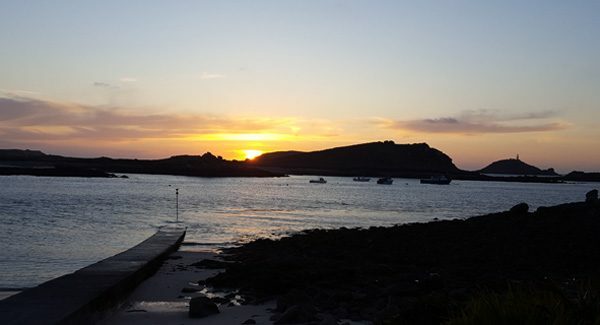 Now it’s time to get ready for our last dinner in the Isles of Scilly… I know it will be another memorable meal! Excellent review. I was salivating and recalling the cuisines of Cornwall. Thanks, Kathy! I am looking forward to our Cornwall experience even more now!